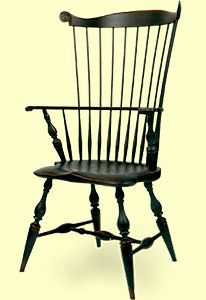 As with all the Windsor chairs we offer, this is an authentic period Windsor chair style. As with the originals, it is made from maple, poplar and hickory for structural reasons. When used alone, this chair makes an excellent accent piece and occasional chair. Around the dining table and with the Fan Back Windsor Side Chair, it is a beautifully coordinated suite of Windsor style seating. It is available in a paint or natural wood finish, and in an aged and distressed paint finish.